Dental is fundamental when you consider that oral health problems can undermine a child's ability to eat, sleep, speak, socialize and learn. The Children's Dental Health Project (CDHP) has created a new infographic to highlight why dental health matters. 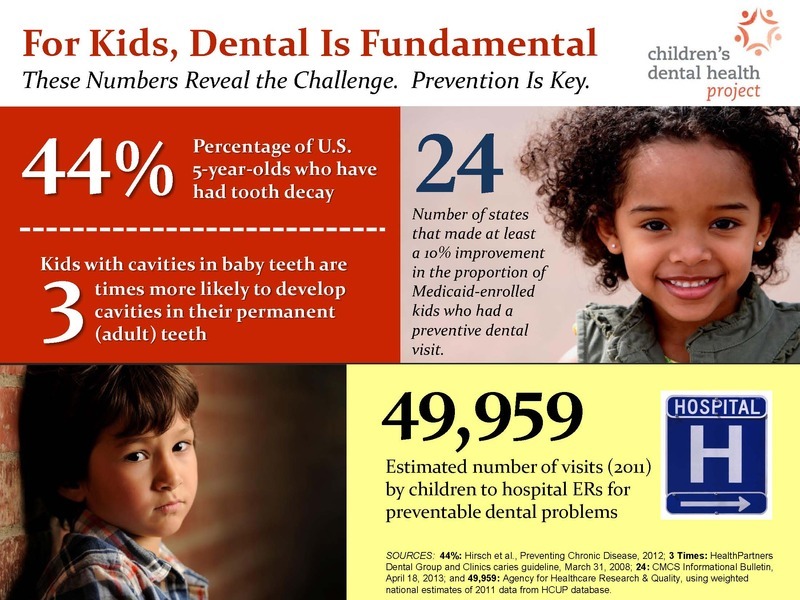 Some of these stats are disturbing, and they serve as a sober reminder that we have a long way to go to adequately address the oral health needs of kids — especially those from disadvantaged communities. But one of the facts in our infographic shares good news: 24 states have made at least a 10% improvement in the percentage of Medicaid-enrolled kids who had a preventive dental visit. This is encouraging because preventing decay is what we're really after. Connecting kids to preventive care not only saves many of them the pain and anxiety of dental problems, but it also saves a lot of money that would otherwise be spent on fillings, crowns or other dental treatments. Kids with decay or more serious dental ailments are more likely to miss school and earn lower grades. Children who enter adulthood with oral health problems are likely to find their overall health compromised. Numerous studies have shown a link between oral health problems and diabetes, stroke and other major medical conditions. So check out our new infographic and share it with parents, community leaders and policymakers in your state. Let's make sure everyone recognizes that dental is fundamental.